After my first 7 days suspension on April 2018, I raised HERE some questions related to the proper use of chat rooms to avoid defamatory actions clearly not compatible with the fair harmony of the community and with our Code of Conduct. In that occasion, indeed, I noticed and I’ve experienced on my person that while a rude but extemporaneous opinion given during an open debate through a comment can lead to a 7 days suspension, a purposeful, deliberate and reiterate public senseless accusations, perpetrated through public chat rooms, which should be aimed to different scopes, had been tolerated and allowed by the community. On May a related very useful discussion was raised by Robert Frost with the following OP: Is CRUDE healthy?. 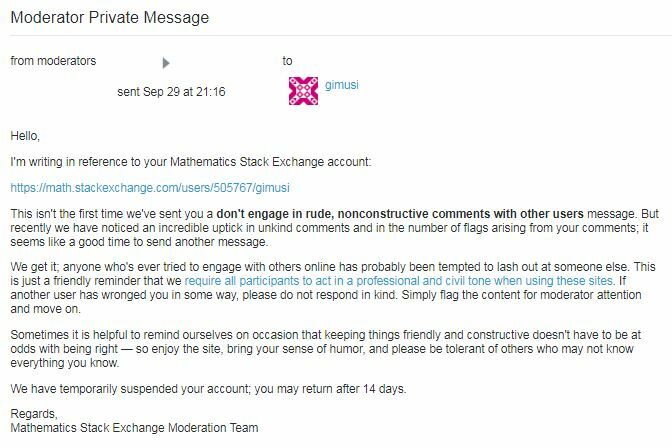 Even if mine was a defensive action, I think that the decision for the suspension by the Moderation Team, as for the first suspension, was totally right since my behavior was an infringement to our Code of Conduct. My opinion is that these infringements to our Code of Conduct through chat rooms discussions should be taken into great consideration and prompt intervention by Moderation Team to avoid that users under attack are forced to defend by themselves and to avoid unpleasant escalations and subsequent long time suspensions. Please feel free to express your thoughts about that issue in the most open and frank way. For my part I will say the following. I don't really regret making those chat comments. I mean, I am not willing to apologize for them at the moment. But I do concede that I'm not at all proud of making them. I didn't want to spell it out in my resignation speech, but the fact that I was powerless to change the fact that gimusi rakes in upvotes by answering PSQs is the chief reason I am no longer a diamond moderator. I will not want to volunteer my time and effort, if the end result is that people reward each other for laziness. Neither askers nor answerers typically search for dupes. This makes the site worse in my eyes. This is an anathema to all the type 1s. I concede that targeting gimusi alone here was not fair as the problems the site is facing (the entire network really) are systemic. They just happened to be a most visible source of irritation. Well, they worked hard to get there. OTOH I am not alone feeling this way. My somewhat related rant has received a mixed response, but mostly positive. I have posted another rant (at a time I was searching my soul trying to decide whether I want to continue), but that is in an area only moderators can see. At that time the wounds were very raw, and it showed. The linked MSE-post is civil in comparison. You should refer the case of my comments to StackExchange staff. You see, our per site moderators are not well placed to judge my actions. I have worked closely together with many of them for many years. They are human beings, not some remote controlled automatons who just enforce a set of rules. It is not at all fair to expect them to ignore the common personal history I have with them. Irrespective of whether they share my antipathy towards proliferations of PSQs or not. The key members of the SE staff have interacted with me also, but they are still a bit more detached about the specifics of what's going on in Math.SE. I think it's high time we all talk it over, and decide on a binding set of rules re PSQs, granting per site mods the mandate to delete the threads in violation, and to save those that are not. Of course, no set of rules will be cast in stone, but lack of clear rules has caused enough drama already. Even slowly moving goal posts would be better. I encourage everybody to read this response from Shog9. It is intentionally open to interpretation. But, it does underline the need to seek a compromise. You see, curators like me are not going to go away. Neither are the help seekers nor the answering machines. There's more where they come from. And some of the current curator/librarians are former prolific answerers, so they, too, will be able to recruit new users. It is absolutely not the position of the moderators to condone abusive behavior in chat. Chat is less formal than the main site, so there is, in practice, a bit more room for heated discussion there (much like on meta). Still, everything must remain reasonably civil. That being said, I do not agree that these comments are unfair or abusive. The users are discussing your activity on the site-- votes you recently cast, answers you recently posted. They're allowed to do that. Stating that they feel negatively about those activities is not the same as targeting you. Even if you have begun to develop a negative reputation in the eyes of these users, I see no evidence here that they have voted on your posts based on who you are, rather than what you've written. We commit to enforcing and improving the Code of Conduct. It applies to everyone using Meta Stack Exchange and the Stack Exchange network, including our team, moderators, and anyone posting to Q&A sites or chat rooms. The code of conduct is clearly intended to be enforced in chat rooms. I would agree that, certainly in public chat rooms, ideally, this should be enforced. The question is, are these examples actionable? If gimusi can answer it, it's a dupe. They [gimusi] have no shame. Both seem needlessly rude, and the latter needlessly personal. It should be pointed out, from the context, Jyrki was a little frustrated at while posting the second comment, but I agree that he should not have said these things. It's important for users to be able to express concerns such as these to expose when such abuses do take place, but such things are better being the subject of a flag. There isn't much call to spread such unsubstantiated negative speculation in public. However, it is worth noting the mitigating factor that such speculation was not presented as fact. All the remaining comments contain observations about your answering habits, and speculation about your voting habits. You are allowed (in the sense of following the rules laid out for the site) to answer PSQs, and to vote to re-open them. However, there is a large contingent of people on this site who resent PSQs and the people who encourage them by answering them. Such people put a lot of effort into quickly closing such questions before people can answer them (it has been suggested that question from new users should start closed and be manually opened). Subverting this process by answering PSQs, or voting to re-open them, will inevitably cause friction between you and these users. The moderators can't force everyone to like you, and I see nothing good coming from them trying to do so. All that said, having a large group of influential senior members resent you creates a significant power imbalance. The community, including regular users and moderators, tend to regard users with high reputation and/or seniority more seriously than other users. Your impressive reputation notwithstanding, the community is more likely going to side against you than with you. But, as I've already said, I don't see any good coming from moderators trying to redress this. I just think it's something that our senior contributors ought to keep in mind when expressing their frustration, no matter how justified they may feel it is. Not the answer you're looking for? Browse other questions tagged discussion etiquette moderators chat be-nice-policy . Why are the vote counts for comments colored sometimes? Why are we not allowed to vote/make edits/leave comments when reviewing questions for closure?